Now retired, Christian's international beach volleyball career lasted over 15 years. Christian has been coaching youth volleyball for over fifteen years; having coached club volleyball at every age level from 13/14U developmental teams to 18U Provincial Champions, and National Medal winning teams. He Head Coached the Volleyball Program at Havergal College in Toronto for ten years. The school would win more than twenty-five Independent School Championships from 13U to 20U, and a Provincial Championship during his time as Head Coach. Ten years ago Christian and three-time Olympian and Olympic Bronze Medalist, John Child started Leaside Volleyball Club. Leaside offers both a house league and Provincial Championship winning club program - welcoming over 1000 registered youths annually. Christian now lives full time in Vancouver with his wife, Olympic Snowboarder and Dr. of Traditional Chinese Medicine, Dominique Vallee, where together they lead active and outdoorsy lives canoeing & camping in the summer and skiing/snowboarding in Whistler, BC. Christian is also the Head Coach for Canadian Men’s beach volleyball team of Grant O'Gorman & 2016 Rio Olympian, Ben Saxton. Widely regarded as "Thor" (and still not having sent in an actual head shot) we're pleased to introduce one of VVL's, and Pacific Coast Volleyball's most popular coaches, Jared Krause. Jared has played both International indoor and National volleyball for over 14 years. He was a setter for the UBC Thunderbirds men's volleyball team and also played over a decade of professional indoor volleyball throughout Europe. In the summertime Jared plays in various professional beach volleyball tournaments across the Pacific Coast. Although he is feared on the court, standing at 6'8", he is a gentle giant and one heck of a youth coach! You can find Jared Head Coaching VVL's skills clinics and Pacific Coast Volleyball's U17 boys club team. Matt played libero at Thompson Rivers University for 5 years and was an assistant coach for 2 years following his playing career. He is currently an assistant coach for the UBC Men’s Volleyball Program where they won the National Championship in 2017-18. Matt has been apart of the U16 Boys Team BC program for 6 years where he has been the head coach the past 2 years. Lainna is new to Canada's Pacific Coast as of Oct, 2018! Having coached with Christian at Leaside in Toronto for 4 years, Lainna enters into her 5th year of coaching club, now with VVL. She is a Certified Development Coach, currently working towards her Advanced Development Coach certification. She brings lots of energy and focus, and is truly passionate about the sport and it's athletes. Lainna currently works for Freestyle Canada Ski National Sport Organization. On the side, she has started a charity called Artists4Athletes, which raises funds for Beach Volleyball athletes and their basic athletic needs. A member of the University of Waterloo Warriors Volleyball Team from 2009-2012. In 2013 she transferred to Humber College to continue her education while competing for the Humber Hawks Volleyball Team. That year she would help the team win their 6th consecutive OCAA championship. Lainna will be the coach of Pacific Coast Volleyball's U15 Girls team this year. She is inspired and driven to coach not only players, but young women to be the very best people they can be, and is very excited to bring her strengths to Pacific Coast Volleyball Club athletes! 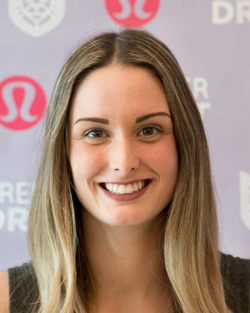 Hailing from Abbotsford, BC, she is currently teaching PE and English at Stratford Hall in East Vancouver. Her playing history as a member of the future Hall of Fame UBC Women's team having won 5 consecutive CIS/U-Sport Championships as the team's starting setter. Unsurprisingly, Brina brings phenomenal insight to the teams she coaches; U16 Team BC girls and U16 team BC boys, as well as U17/18 girls at Thunder Volleyball club. Pacific Coach Volleyball Club is extremely fortunate to have Brina on board for our inaugural season, and strongly encourages all athletes to pick her brain for tips and valuable lessons she's learned throughout her career as a top athlete and coach. Kelly has played volleyball since grade 5 and has coached U13 and U14 for Thunder Volleyball in recent years. As an alum. of Little Flower Academy and Thunder Volleyball, she continued her volleyball career at the University intramural level while swimming for Western's Varsity swim team. As a multi-sport athlete Kelly brings high-level focus on developing building blocks in each individual athlete tailored for where they are at in their own game. Kelly's approach to coaching fosters great team atmosphere's and support. Kelly loves watching her team come together, develop, and improve throughout their season. When Kelly isn't coaching, she works as a sales rep in Western Canada representing Speedo and Lualoha Towels. Vince has been coaching youth volleyball for over 10 years. Vince has graduated from UBC with a Bachelors in Human Kinetics and a Masters in Educational Leadership and Administration. We're extremely excited to have someone like Vince on our coaching staff as his educational and coaching history has helped him become a coach who is truly passionate about teaching and coaching - his goal is to be persistent in building self-efficacy of our next generation of youths through sport. With experience coaching students ranging from grades 2 through 12, he excels at coaching youth athletes helping to create excellent foundations for future development at the post-secondary level. Most recently, Vince has been coaching senior girls high school volleyball as part of the Vancouver Secondary School Athletic Association. Murray was born and raised in Prince George and was a standout high-school athlete, playing for Kelly Road Senior Secondary for three years. After graduating in 1999, he played in the ACAC for the Grande Prairie Wolves and led his team to a bronze medal in the CCAA National Championships in 2000. From Alberta, he headed east and played two years for the University of Manitoba, winning a bronze medal in the CIS National Championships in 2002. He completed his eligibility as a Bison and then turned pro in 2004. Murray has been playing professionally overseas for 5 years. Making stops in Sweden for two seasons. Switzerland, the Netherlands and Indonesia. In addition, he spends his time playing beach volleyball in the lower mainland. Murf has been the assistant coach for both the indoor and beach volleyball provincial teams. Indoor 18u Boys in 2015. Then in 2018, the 18u girls and boys beach with 2016 Olympian Jamie Broder as the head coach. He was also the head coach for the Zone 5 Summer Games beach team in 2018. Jessica was born and raised in Oshawa, Ontario before making her big move out west! She attended Durham College from 2013-2016, where she received MVP and OCAA First-Team All-Star recognition each season. In her final year, she was awarded Female Athlete of The Year and left Durham College as the all-time record holder for total kills, aces and second for over-all points. After her varsity career, she turned to coaching. In 2016 for Durham Attack 18u girls and in 2017 for the Seneca Sting Women's Volleyball team. She has also spent the last 11 summers coaching 14u and 15u girls at Madawaska Volleyball Camp in Bancroft, Ontario. In her spare time, you can find her volunteering for VOKRA as an Adoption Counsellor or cleaning up the Vancouver beaches with the Surfrider Foundation. At 15 years old, Maddy began coaching with UBC Thunder clinics. She had the pleasure of being the assistant coach for the 2014 Zone 5 Summer Games u15 girls volleyball team where they placed second. She has been the assistant coach for Crofton House’s varsity volleyball team for the past three seasons, winning the BC Provincials Championships the past two years. Maddy has experience coaching girls ages 10-17. She is excited to coach with PCVC to connect with and positively influence the younger generation of girls volleyball players, as well as to continue to grow as a coach. As a player, Maddy played for Crofton’s varsity team for four years along with playing for Thunder and Ducks volleyball clubs, winning a provincial club championship and a couple provincial all-star awards. She went on to play for the McGill Martlets for one year before hanging up her knee pads and deciding to focus on school and coaching. She is currently finishing her last year of her undergraduate degree at UBC with a major in psychology and minor in special education, and hopes to continue onto grad school studying school psychology. In her spare time, you can find Maddy working in preschools or cuddling her cat.